Lesson #1: Why Invest In Stock Markets? 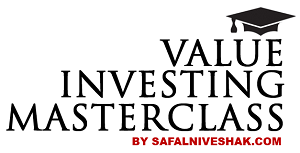 Value Investing Masterclass is a course that will teach you the simple and sensible strategies to invest in the stock markets to grow your wealth over the long term. All of us have a long list of financial goals, starting with things like paying the EMI of our house, putting food on the table, and paying all other bills so that we live comfortable lives. When you work your way down the list, you get to things like replacing the old car, buying a second house, putting the kids through college, and retiring. You see, most of our wants, including a luxury car and a foreign holiday that you’ve promised your wife, will exceed our expected lifetime earnings. Forget the wants, how do plan to meet at least the critical financial needs that will arise in the future – like putting the kids through college, and your own retirement? You already toil hard, sacrifice your personal life, and sometimes your health to earn money to meet your expenses and save for the future. But amidst all this, how much thought do you give to the fact that you can take help from ‘someone else’ as well to earn us more money to help you meet all your financial goals in the future? That ‘someone else’ is none other than your own money – what you are earning and saving today. Yes, your own money can earn money for you…and lots of it! People who are rich know this for a fact. But most of us in the middle class don’t. After all, our school and college education has never taught us this way to earn money. And neither have our parents. What we have always learnt is to study well, get a good job, earn money, and save for the future. Nobody has really told us that there’s one more aspect to our working and earning life – investing for the future. Learning how to compound our money. Einstein was once quoted saying “The most powerful force in the universe is compound interest.” He is also rumoured to call it the ‘ninth wonder’ of the world. If you haven’t heard about ‘compound interest’, it is defined as the interest on an investment’s interest plus the investment amount. To explain it in simple terms, let’s assume you invested just Rs 100 in a savings account that earned 10% interest per annum. In one year’s time you would have Rs 110 in your account. The following year you would be earning 10% not only on your original Rs 100 but also on the Rs 10 you had earned as interest in the first year. Now you would find this as a fickle example, and see no reason Einstein called it a powerful phenomenon. But don’t make the mistake which this king made. The kind was so impressed with the game of chess that he invited the man who invented chess and asked him to name his reward. “Yes, your highness” affirmed the humble inventor. “So it shall be!” ordered the king, and his courtiers started placing the grain on the chess board. One grain on the first square, 2 on the second, 4 on the third, 8 on the fourth and so on. By the time they came to the 10th square they had to place 512 grains of rice. The number swelled to 5.2 lac grains on the 20th square. When they came to the half way mark, the 32nd square, the grain count was 214 crore! Soon the count increased to lakhs of crore and eventually the hapless king had to hand over his entire kingdom to the clever inventor. That’s the power of compounding that you must understand and appreciate! Here is a chart that shows how much Rs 1,000 will grow to in 25 years, at 10% return per annum compounded (to Rs 10,835). “Isn’t my money compounding in Fixed Deposits?” You might want to ask. No it’s not. It may well be shrinking. Most Indian middle-class households ‘save’ money – in safe deposits of banks and post offices, or in the form of gold and silver and assume that they have invested the money. You might be one of them too. But do you know how much our money grows when kept in these ‘safe’ places? A bank account can give you a maximum of 3-4% interest per year. A bank fixed deposit or a post office saving will give you somewhat better, but only 6-7%. Gold and silver won’t earn you anything till the time you don’t sell them. And as far as property is concerned, in a normal year, it can rise at an 8-10% rate as well. “Aren’t these good returns?” you might ask. Not really, let me say! While calculating your ‘real’ return from all these or any other avenue, we must also take into account the ‘inflation’ factor. In simple terms, inflation is nothing but a rise in prices of things that we consume. So, if we are paying Rs 50 a kg for onions today while these were costing Rs 10 a kg one year back, the rate of inflation is a whopping 400%. But this is an exception. Inflation is India has generally been in the 5-7% range over the past many years. And it is expected to remain in this range in the future as well, notwithstanding sharp spikes and falls in between. So, when you calculate the ‘real’ return on your investment, you must reduce the inflation rate from your total return. Like, if your bank account gives you an annual interest of 4% while inflation is at 5%, your real return equals a negative 1% (-1%). And if a fixed deposit gives you 8%, your real return will stand at 3% (8% minus 5%). Now do you think that this kind of return is fine, especially when inflation rate is only going to rise in the future (given the rising shortage of everything we consume)? It isn’t. I mean this is not what we can call ‘growth of our money’. Inflation actually eats into our money. And how? Let’s assume that you have Rs 100 with you are looking to buy onions. At a rate of Rs 10 per kg, you will end up buying 10 kg of it. But what is the price rises to Rs 50 a kg after one year while you still have only Rs 100 to spend? In that case, you will be able to buy only 2 kg of onions. That’s the negative effect of inflation – the value of every rupee you will have in the future will be lesser than the value of that one rupee today. And that’s the where the concept of investing and inflation comes into play. To grow your money fast at a time when inflation is eating into it is very important. Forget onions. Look at the total cost of living that is rising at such a fast pace these days that that we need to prepare ourselves well to meet our future financial obligations. And these can include our children’s high education and marriage, our parents’ healthcare needs, and our own retirement. All these are big expense items and as such we need to save and invest a lot to collect their kind of money over the next 5, 10, 15, or 20 years. Let us now look at how many years you will take to accumulate Rs 10 lac for your new born daughter’s higher education 18 years down the line, if we start with Rs 2 lac today. We will assume real returns (total return minus inflation of 5%) of different avenues to arrive at this number. Here’s the chart that shows it all. As the above chart shows, the only way to meet you target of reaching Rs 10 lac (if you start with Rs 2 lac today) in 18 years is to invest in stocks. While your bank FD will not get you anywhere, the property route will take a much longer time that what your requirement (of 18 years) permits. These calculations are not based on some random numbers. These are exactly what these investment avenues have earned over the long term in the past. Thus we arrive at the fascinating (though risky) world of stock markets – one of the most critical investment avenues that can help you achieve your long term financial goals. I just said that stock market is a risky place, but so are our lives. There is always a risk in anything we do. But then, with the right education and research, we can minimize that risk. And as we get more education, we can better decide how much risk we want to take and conversely how much return we can make safely. Understanding the risks is the first step toward minimizing them. In fact, it is possible to make 10-15% annual return on your stock market investment with almost no risk. But only if you know what you are doing. Let me explain the The Law of The Farm to drill down the importance of right knowledge and patience in stock market investing. There are certain laws, like the law of gravity which you cannot repeal. These laws govern the universe. One such law is the Law of the Farm. This law states that a farmer cannot expect to harvest a great crop unless he carefully plans for the development of that crop and works diligently and consistently over a long period of time. The farmer first needs to prepare and fertilize the soil, plant the seed, water and nourish the sapling, tend to the weeds, protect it from the insects and diseases and constantly monitor before the time for harvest comes. The farmer cannot plant a crop, do nothing for six months, and then expect to have a great harvest magically. These things take ongoing effort throughout the whole process. But, ironically, in the stock market, most of us would want our stocks – mostly bought on tips and borrowed conviction – to fly and earn us fast returns. We somehow think we can dismiss natural processes, cheat the system, and still win the day. As on the real farm, success in life, business, and investing comes from regular disciplined, regular effort. You can go for the quick fixes and techniques with apparent success in the short run (like four-baggers in four months). But in the long run they just don’t work. So please remember, in investing as in farming, a rich harvest would come to you not from finding easy shortcuts, but from disciplined, focused effort, directed tirelessly toward a desirable goal. There are many paths you can go down when you get into investing in the stock market. But there’s one thing you can be sure of. With education and research you will make money. You are already beginning your education here. That’s a great start! Continue on this road and make your money work for you.